After starting his professional career at Industrias Ferri in 1993, José Luis Blanco joined Gamesa in 1997 where he held different management and Chief Officer Positions until 2012. He started as Blade Plants Director, CEO Gamesa Eolica USA, COO for Gamesa USA, Gamesa Solar Engineering Director and later CEO as well as Gamesa Offshore Director. He became Gamesa´s Chief Customer Officer and member of the Executive Committee in 2011. José Luis Blanco joined Acciona Wind Power as CEO in 2012. PADE. Senior Management Program, IESE Business School, Madrid, Spain. Management Program in Strategy & Operations Management, Caixavigo Business School, Vigo, Spain. Degree in Industrial Engineering (& Msc Mechanical), Vigo University, Spain. 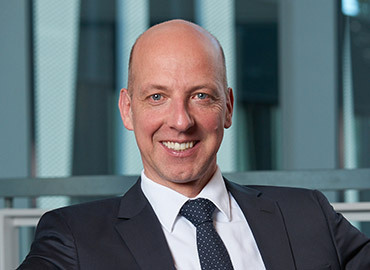 Christoph Burkhard began his career in the area of finance. He started as an analyst for the European Commission in Luxembourg, subsequently moving to BHF Bank in Frankfurt. Thereafter he worked outside Germany for BHF Bank in the Czech Republic (Prague) and for the European Bank for Reconstruction and Development (EBRD) in Russia (Samara and Togliatti). In 1998 he moved to Siemens Financial Services in Munich, where for 6 years he structured and negotiated project and export finance deals for the Siemens operating units. In 2004 he took on a leading commercial position in the large-scale project business of what was the Siemens Mobile Networks division at the time. Next he changed to Group Strategy at the Siemens headquarters before moving to Hamburg with his family in 2008 in order to start at Siemens Wind Power as CFO for the EMEA Region in the onshore wind business. As of 2011 he then assumed global responsibility for the onshore wind business at Siemens as CFO until moving to Nordex on 1.9.2016. In his position as CFO he is responsible in particular for the Corporate Finance, Accounting, Controlling, IT and Legal divisions, including taxes and insurance. After starting his professional career at Guascor and Azkoyen, Patxi Landa joined Acciona in 2002 where he held different management and Chief Officer positions. He was CEO at Acciona Energy Australia and Acciona Solar Power in the US. In 2007 he was appointed Business Development Director and Executive Committee member at Acciona Windpower. Degree in Economics and Business Sciences, University of Navarra, Spain. Master of Business Administration (MBA), EOI Business School, Spain. PDG, General Management Program, IESE Business School, Navarra University, Navarra, Spain.